It started with a glass octopus. Dusty, broken, and all but forgotten, it caught Drew Harvell’s eye. Fashioned in intricate detail by the father-son glassmaking team of Leopold and Rudolf Blaschka, the octopus belonged to a menagerie of unusual marine creatures that had been packed away for decades in a storage unit. 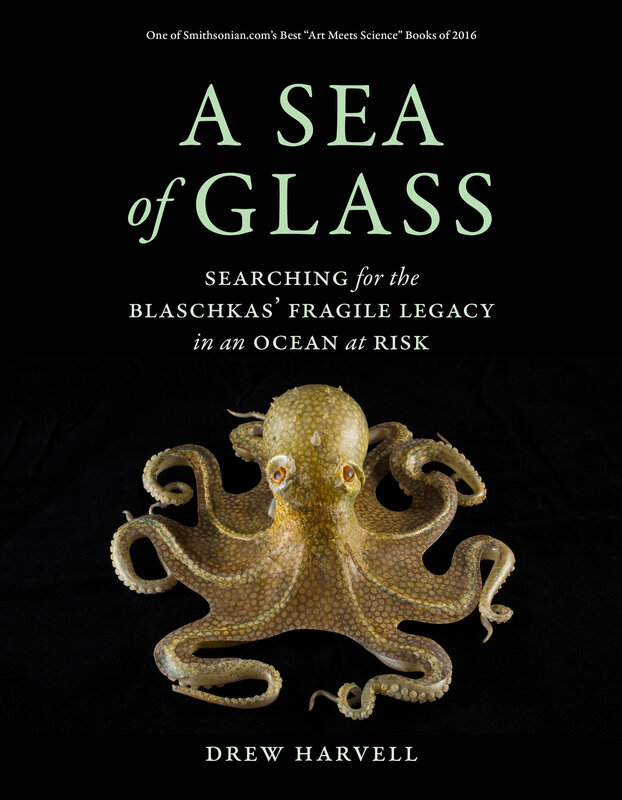 More than 150 years earlier, the Blaschkas had been captivated by marine invertebrates and spun their likenesses into glass, documenting the life of oceans untouched by climate change and human impacts. Inspired by the Blaschkas’ uncanny replicas, Harvell set out in search of their living counterparts. In A Sea of Glass, she recounts this journey of a lifetime, taking readers along as she dives beneath the ocean's surface to a rarely seen world, revealing the surprising and unusual biology of some of the most ancient animals on the tree of life. On the way, we glimpse a century of change in our ocean ecosystems and learn which of the living matches for the Blaschkas’ creations are, indeed, as fragile as glass. Drew Harvell and the Blaschka menagerie are the subjects of the documentary Fragile Legacy, which won the Best Short Film award at the 2015 Blue Ocean Film Festival & Conservation Summit. Learn more about the film and check out the trailer here. Drew Harvell is Professor of Ecology at Cornell University, Curator of the Blaschka Glass Marine Invertebrate Collection, and author of Ocean Outbreak: Confronting the Rising Tide of Marine Disease.